Just sent this, a small 105 x 150mm woodblock print, for To Haiti with Love. Not quite sure how it will work but the artworks donated will be available for hi-res download and also the original prints for auction in an event tba. Anyway, the idea here is very simple; a geo-typographical cross-section with the sense that Haiti is actively rebuilding itself. A week of reflection and patchy wakeful nights. 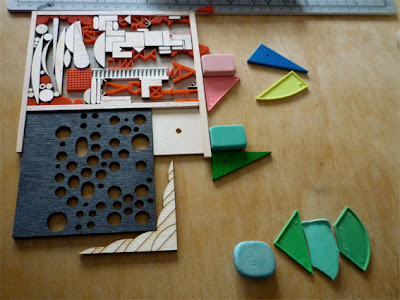 Looking at my students' work. Quite something to be in a room with the collective ability and intelligence of 55 people. Talking as we go, inevitably about 'the subject of illustration'. We are lucky to be custodians of so much talent, in what is perceived as a boom-time for the subject. We and they dream to an extent of what could be as well as being excited about what is. We have, for example, some amazing children's book illustrators. We also have, for example, some amazing makers and writers and performers. I don't want them to have to shut down their options completely to fit the market. Or to have to abscond to another industry. I like having people who want to create the best children's books alongside people who want to author and experiment with other platforms (often the same person has the potential for both). Actually I don' t think one is more experimental than the other. But it's nice when it co-exists. And is not polarised. These activities nourish each other. 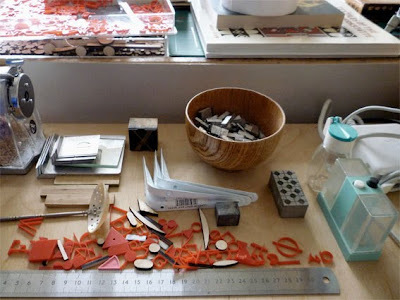 I look at Forms of Inquiry and think that this kind of space or community needs to exist for Illustration too. Critical Illustration? 'Critical' always seems to imply, in this subject, a kind of process-paralysis. I think one can make and think. I look at Four Corners Books and see a thing in the world that has the most archetypal attributes; a story with pictures. But it is for grown-ups. It is designed holistically. The concept. The images make you work a bit. Something you accept when you go to a gallery. It suggests what could be. Holly Wales came in this week and was so interesting in conversation. We discussed these and other bits and pieces but here is someone with a level head, one eye on the market and one eye on the horizon. 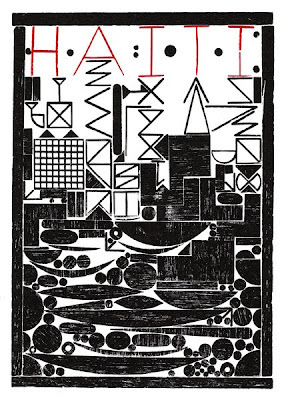 I'm also thinking about Piet Zwart's two-colour letterpressed experiments, as seen in the Tate; Edward Wright's Flaxman typeface; and making this postcard-sized plate to print for the 'To Haiti With Love' fundraiser. More soon. 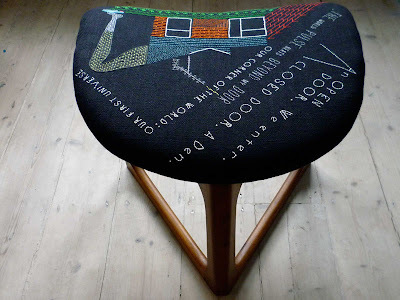 So, here's The Shoe Stool finished before delivery to its new home. 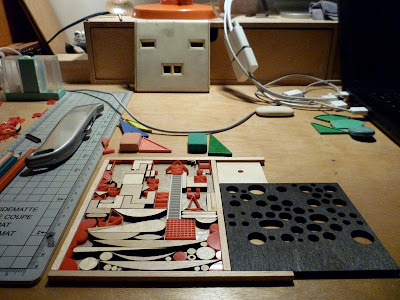 The previous post discusses the text's origin in The Poetics of Space by Gaston Bachelard. Sally translated the drawing wonderfully into stitch, with some extension to her technique. 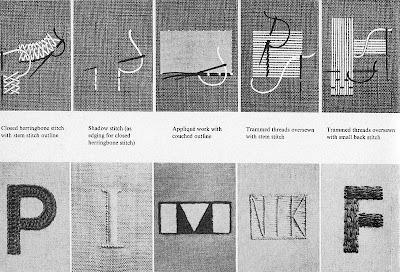 Through a first sighting on AAPC and a recommendation by Luke, I landed a copy of Elsie Svennas' A Handbook of Lettering for Stitchers (1966). 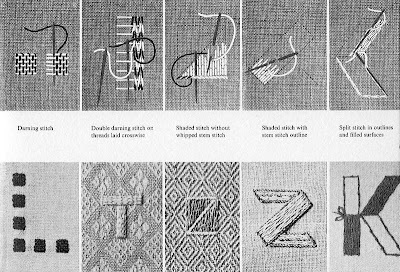 These spreads indicate the food on offer; for this project, the trammed-thread filling stitch shown above was adapted for the leg tone. Here's a detail. 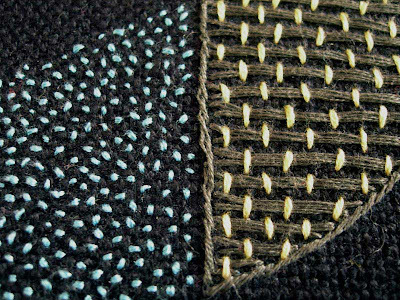 Our collaboration is working best when we think together about the physical equivalent to linework, acknowledging the behaviour of a needle through quite coarse linen-cotton texture and allowing for this to lead a little more. 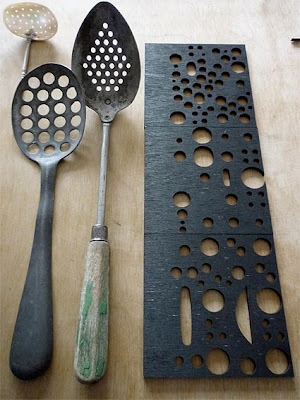 Always a mesh of visual cues that sort of rhythmically feed the language. I'm looking a lot at the exchange between Susan Kare's original pixel-textures for MacPaint and Memphis' inventory of Po-Mo-pattern, as seen and discussed on Rob Giampietro's incredibly info-rich and inspiring Lined & Unlined. Chipping too at a kind of needly eeriness, something that detained me greatly as a child, around a padded, skipping step of malign characters in fairy tales. This image (via) from Heinrich Hoffmann's Struwwelpeter (1845), holds it in the arch small foot and meaty calf. The non-perspective of the wall had its say too. So somehow this part of the original drawing became a little obsession; and a leader for other forms to follow. 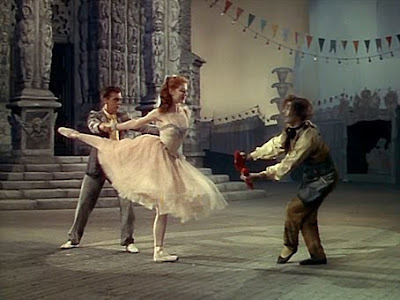 Robert Helpmann's cobbler in (the unmatched) Michael Powell/Emeric Pressburgers' The Red Shoes (1948) has always rattled around in a corner of one's picture-memory for similar reasons. 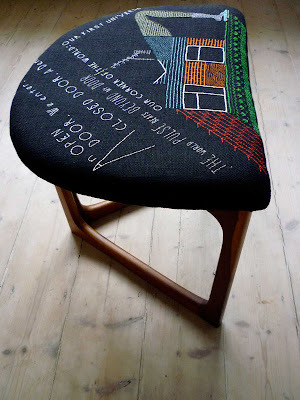 Just finishing a chair commission, with Sally embroidering my drawing and upholstering to a three-legged stool. 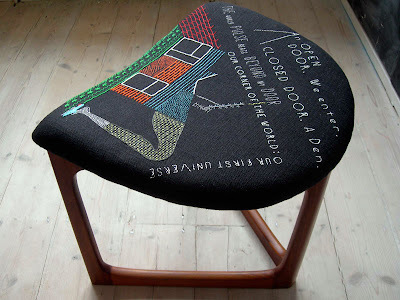 A lovely brief, to source a low chair to sit upon when putting on and taking off shoes; to make a typographic drawing about this action and the sensation of entering and leaving behind the world outside one's door. The text is taken from Gaston Bachelard's The Poetics of Space. 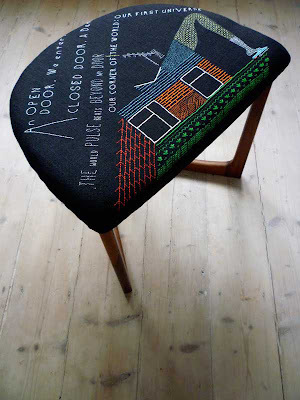 The bungalow, with its very nice interior parquet, is the home-to-be for the stool. 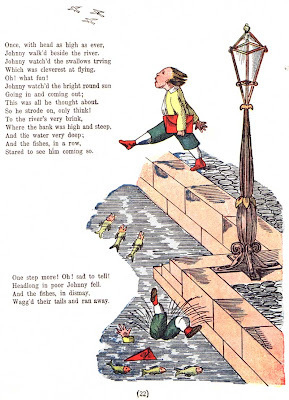 I wanted the asphalt-emergent leg to have an Alice/Struwwelpeter creepiness. Will post images of the finished chair in the next few days. This week's yet-to-be-letterpressed open drawing poster, for a potentially wonderful performance drawing workshop led by Maryclare Foá. The venue, used each week for this season, has the trace of Michael Caine's hated schooldays, Buckminster Fuller lecturing on his Geodisic Domes and, she reveals, Tommy Cooper performing magic. If you've never seen him, this is he. No idea if this ever translated as funny outside of the UK; mercifully he was better than Benny Hill. Now for the letterpress.